Key Contemporary Social Theorists is a comprehensive introduction to some of the most significant figures in social, cultural, political and philosophical thought of the twentieth century. This collection of newly commissioned entries offers students and scholars an authoritative guide on current contributions to contemporary social theory and social science. Preceding the entries is a well-organized chart of the main trends of development in social theory. The result is an invaluable reference work for all those concerned with central issues in contemporary social theory. Anthony Elliott is Professor of Social and Political Theory at the University of the West of England, where he is Director of the Centre for Critical Theory. He is the author of Subject to Ourselves (Polity, 1996), Social Theory and Psychoanalysis in Transition (Second Edition, 1999), Concepts of the Self (2001), and editor of The Blackwell Reader in Contemporary Social Theory (Blackwell, 1999). Larry Ray is Professor of Sociology at the University of Kent. He is the author of Rethinking Critical Theory (1993), Social Theory and the Crisis of State Socialism (1996), Theorizing Classical Sociology (1999), and the co-editor of Organizing Modernity (1994). ntroduction. Anthony Elliott and Larry Ray. 1. Theodor Adorno: Maggie O'Neill. 2. Jeffrey Alexander: Paul Colomy. 3. Louis Althusser: Ted Benton. 4. Hannah Arendt: Phillip Hansen. 5. Jean Baudrillard: Rex Butler. 6. Zygmunt Bauman: Ian Varcoe. 7. Ulrich Beck: Joost van Loon. 8. Daniel Bell: Malcolm Waters. 9. Jessica Benjamin: Kay Torney Souter. 10. Walter Benjamin: Howard Caygill. 11. Homi Bhabha: Bart Moore-Gilbert. 12. Maurice Blanchot: Kevin Hart. 13. Pierre Bourdieu: Don Miller. 14. Manuel Castells: Nick Stevenson. 15. Nancy Chodorow: Diane Tietjens Meyers. 16. Gilles Deleuze: Claire Colebrook. 17. Jacques Derrida: Roy Boyne. 18. Norbert Elias: Robert van Kriekan. 19. Michel Foucault: Gerard Delanty. 20. Hans-Georg Gadamer: David West. 21. Anthony Giddens: Anthony Elliott. 22. Erving Goffman: Yves Winkin. 23. Jürgen Habermas: William Outhwaite. 24. Stuart Hall: Michael Kenny. 25. Max Horkheimer: Larry Ray. 26. Luce Irigaray: Kwok Wei Leng. 27. Fredric Jameson: Andrew Milner. 28. Julia Kristeva: John Lechte. 29. Jacques Lacan: Stephen Frosh. 31. Niklas Luhman: Dieter Rucht. 32. Jean Francois Lyotard: James Williams. 33. Herbert Marcuse: Jem Thomas. 34. Claus Offe: John Dryzek. 35. Richard Rorty: Matthew Festenstein. 36. Eve Kosofsky Sedgwick: Annamarie Jagose. 37. Alain Touraine: Kevin McDonald. 38. Bryan S Turner: Barry Smart. 39. Paul Virilio: Scott McQuire. 40. Raymond Williams: Andrew Milner. 41. Slavoj Zizek: Anthony Elliott. Contains up-to-date coverage of key theorists in sociology, social theory, philosophy, cultural studies, feminism, psychoanalysis and philosophy. Theorists covered include Benjamin, Elias, Goffman, Lacan, Said, Jameson, Heidegger, Giddens, Bauman, Williams, and many others. Each essay describes the life of the theorist, main ideas, and key criticisms. Includes boxed-out sections to aid the reader. 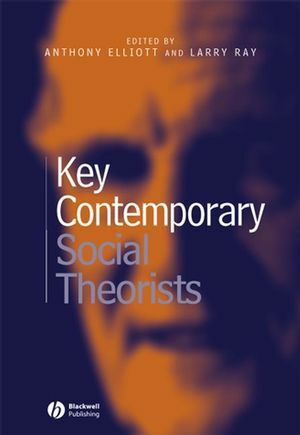 Covers key schools of social thought - including critical theory, structuralism, post-structuralism, hermeneutics, psychoanalysis, systems theory, structuration theory, action theory, feminism and postmodernism. Internationally recognized editors and contributions from internationally distinguished authors, as well as more recently published authors.